i have been requested to make a controlling panel for a generator with LCD to monitor the generator status. the temperature sensor as in the attached photo - vdo 801/1/46 and is operating voltage is 6 - 24 v.
and i just knew how to interface 5 volt sensors. i tried to search for its datasheet but i didn't find it and it is NTC sensor. can i get help and ideas about how should i interface it with atmega series. Surely a NTC if a thermistor is going to be read proportional to the supply voltage. You must have some idea of the connections? 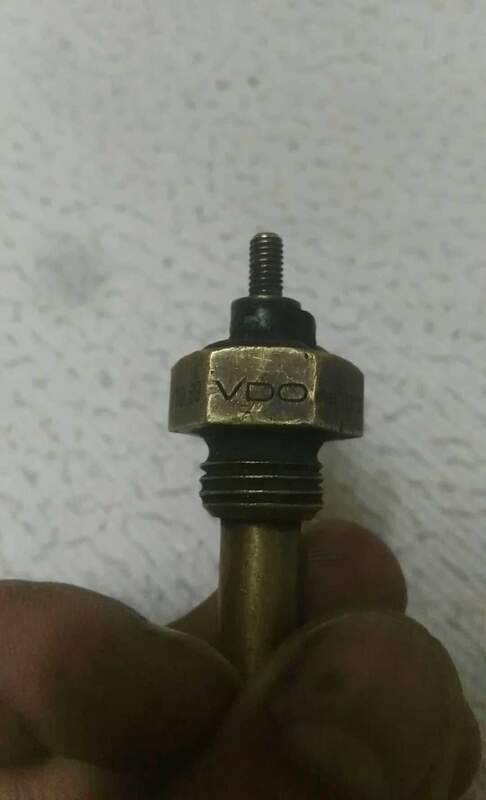 Do you see the "VDO" stamped on the part? If good enough drive, and a common ground with the excitation, one could perhaps use a simple resistor divider. Perhaps with a zener to protect the AVR pin? i know that to interface an NTC sensor u should have a Beta constant to use its equation. so i can find the relation between the temperature and the resistance. am I right or there is something solution? cuz i couldn't find the Beta constant. Well, you don't have to. In most of my thermistor apps, I use a bias resistor to pull the curve close enough to linear to use a line-fitting equation gotten with the help of Excel. In other apps, I use a lookup table and linear interpolation. In a couple apps. I use Steinhardt-Hart work. Related to your "beta" comments. It can be derived from the tables in that datasheet. i'm not that good in electronic circuits yet, so which way u advice me to use in my application. so i can try to design it and show it to u again if u don't mind. Note: A VDO temperature >>switch<< is another possibility. Note that if you don't want to readout the actual temperature you can make it easy, just set a trip voltage for whatever you want to do. That is, when the desired temperature happens, set the trip point to match the voltage that is happening at that time. For example, oven control...I set a trip voltage & the oven heats up. But the oven is still not as hot as I like. So I adjust the trip voltage up (assuming higher volt is higher temp) slightly...now it is closer. Maybe then I adjust another time. Now the oven is where I want it & maintaining, but at no point did I readout the numerical temperature using the sensor. This is much much easier, since you can go anywhere & buy a thermometer. A simple web-based Arduino tutorial is always a good place to start for any new topic in electronics, regardless of your level of expertise. Any voltage from a sensor that is above Vcc (either +5 or +3.3) will be needed to be scaled down before it is fed into the ADC input. The simplest way to do this is with two resistors. It is a good idea to buffer this voltage with a non-inverting op-amp and a simple LM358 op-amp [that can operate at Vcc=+5 and Vss = ground 0v] will do fine. Measure the resistance at 25C, that should determine what NTC you have and the required data is in the vdo datasheet posted earlier. Then all you need is one resistor and some code. Then all you need is one resistor and some code. One carefully selected resistor if you are driving the sensor at 24 V! You will need to insure that over the possible range of temperatures the resistive divider output doesn't exceed Vcc. Optionally, of course, one can select the resistor to best match the NTC for the expected temperature range, and then have a level converter of sorts to drive the ADC input. Either way, also, one should consider how fast they wish to measure the data, and decide if the NTC/Resistor can tolerate a small cap across it to keep the source impedance for the ADC <= 10K, or whatever the data sheet for the selected micro stipulates. Then let the water cool slowly and put some reference thermometers in it. Take some measurements at different temperatures. And of course, some water and ice mixed thoroughly will be a steady 0 Celcius. After that you can then either match it to a NTC curve or use simple piece wise linear interpolation. Uhm, are you sure it is an NTC, or is that just a guess? When you do the measurements above you will have a pretty good idea.